The cooler weather really has me in the mood to bake, and what better item to make on a lazy Saturday afternoon than a coffeecake for tomorrow’s even lazier Sunday. Blackberries are my favorite berry, and I love them paired with blue cornmeal. The cornmeal turns the cake a pale purple color and it adds a great texture as well as a little extra fiber. Mix together the cold butter, brown sugar, flour, and cinnamon with your fingers, pinching everything together until if forms a crumbly mixture. Mix in the walnuts and refrigerate until ready to use. Cream the butter, sugar and citrus zest together until light and fluffy. Add the eggs and sour cream and mix thoroughly. In a separate bowl, mix the flours, cornmeal, powder, soda, and salt to combine. Fold the dry mixture into the wet, about one third at a time until just combined. Scrape into a greased 8×8 glass or ceramic baking dish and spread evenly (batter will be thick). Top with the berries (don’t forget to dry them) and finally, crumble the streusel on top and place the dish onto a heavy sheet pan. This will prevent the bottom from over-browning as well as prevent any drips from the blackberries. Cover loosely with foil and bake for 25 minutes (the foil will prevent the walnuts from burning). Remove the foil at this point and continue to bake for another 15-25 minutes, or until a toothpick or skewer comes out of the middle of the cake free of batter. 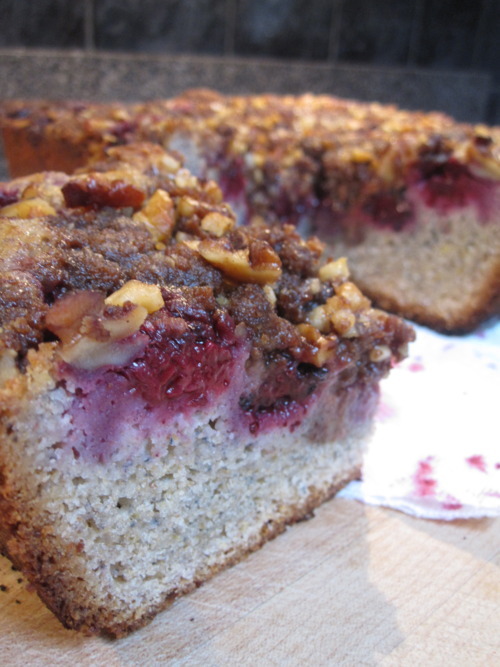 This entry was posted in baking and tagged blackberry, blue cornmeal, breakfast, coffee cake, dessert. Bookmark the permalink.